Black Creek Farm is a small family farm located in Rockburn in the municipality of Hinchinbrooke. This is where the owners, Denis Rousseau and Jane Collins, have decided to settle and start their new project. While spending numerous weekends in beautiful New England, we have discovered “English-style” cider. 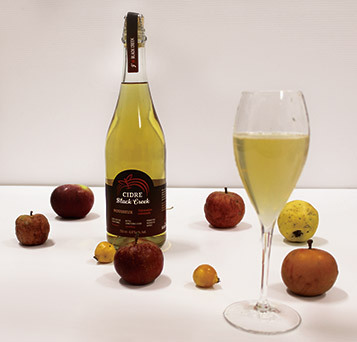 This cider is made from special apple varieties rich in tannins. These apples are grown specifically for making cider. For our project, we purchased and planted these varieties, as well as Heirloom varieties, on our property. We then went on to learn cider making techniques through specific courses given by world renowned cidermaker and consultant, Peter Mitchell. Our first cider was crafted in 2015 using apples from our new orchard as well as apples from our existing old orchard. Fermentation is carried out according to the traditional method, giving time to the cider to develop its aroma. The result is a dry well-balanced cider. Its citrus and exotic fruit notes along with its freshness make the cider excellent with cheese, but it would also be a good companion with any meal. We also have tapped the maple bush on our land. Although you can always enjoy our maple syrup, be on the lookout for a new alcoholic beverage fermented from our maple syrup. Check back regularly to see what we are working on.